Tips to Choose Custom Engagement Ring #infographic ~ Visualistan '+g+"
Every wedding ceremony will have its individual qualities, and no two people can be accurately equal. Couples head to various jewellery shops to purchase engagement and wedding rings but these rings are created in bulk. As an outcome they might lack the individuality and gorgeousness which the couples are searching for. However you can attach the touch of your imagination and rareness to your personal ring with custom made jewellery services. Couples, these days, are choosing personalized engagement jewels to show their love towards each other. Personalized jewellery indicates uniqueness. 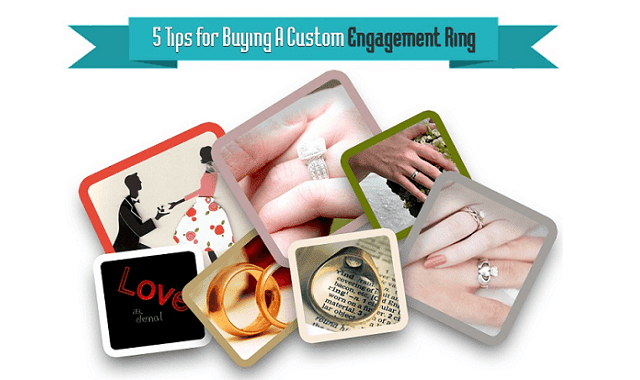 3 out of 5 couples are selecting bespoke engagement ring. 41% of the couples either entirely design their rings with the jeweller or put in several custom elements to a presented design. 86 percent of the brides assume that the design of the ring is most significant and only 47 percent of them rate the size of the diamond as a “somewhat key attribute.” This infographic, created by AG and Sons, highlights the tips to consider while choosing custom engagement ring.